Democratic voters were more likely to support the referendum than were Republicans, but about six in 10 of those who identified themselves as Republicans in the survey said they favored the change in the county’s alcohol ordinance. On Nov. 4, county voters approved the referendum authorizing the county to change its laws, with the initiative receiving 65.4 support overall and being approved in all 13 of the county’s precincts. The survey, conducted in the three weeks before that vote, found that 67.3 percent of the 297 registered voters at the time they were interviewed said they favored the referendum. Twenty-five students in a graduate research methods class I teach at the University of Georgia conducted the survey, under my direction. The class project is designed to help students learn about scientific sampling, surveys in general, and data analysis. The students drew a simple random sample from the county’s list of 24,662 registered voters, which I purchased from the Secretary of State office on Sept. 13. The students completed interviews with 297 of the 999 names drawn for the sample, or 29.8 percent. The interviews were completed by telephone (39.1 percent), online after first contact via email, through Facebook, or by some other means (32.7 percent), via the regular mail (21.5 percent), and in-person (6.7 percent). The characteristics of those interviewed closely matched those of registered voters in terms of race, precinct registration, year of registration, and ballot cast in the May primary. For example, 85.2 percent of the registered voters in Oconee County on Sept. 13 were classified as White, and 88.2 percent of the sample was White. Among Oconee County voters on Sept. 13, 26.3 had registered from 1950 to 1998, and in the sample, that figure was 27.6 percent. Women made up 52.4 percent of the registered voters in the county, but they made up a slightly higher percentage–58.6–of the sample. The margin of error for the survey is 5.7. The error term signifies that the odds are 19 to 1 that the responses from the sample would reflect within plus or minus 5.7 percent those of registered voters in the county had all voters been interviewed. In other words, the odds are 19 to 1 that the actual percentage of registered voters who supported the liquor-by-the-drink referendum during the survey period would have been 67.3 percent plus or minus 5.7 percent, or between 61.6 percent and 73.0 percent. The actual vote in the Nov. 4 election of 65.4 percent falls in that range. There is no guarantee that the persons interviewed in the survey actually voted, though it seems likely that a majority of them did vote. Turnout for the Nov. 4 election in Oconee County was 60.8 percent. Oconee County voters turned down liquor by the drink in 2002, 1996 and 1990. Only 45.2 percent of the electorate voted in favor of the referendum in 2002. Only 40.4 percent had approved in 1996, and 48.2 percent had voted for it in 1990. BOC is scheduled to give second reading to an ordinance allowing the sale of alcohol in county restaurants at its meeting on Jan. 6. The Commission, without a vote of the citizens, passed an ordinance allowing the sale of beer and wine in restaurants in 2008. State law allows the BOC to take action on beer and wine without a county vote, but it requires a vote on alcohol sales. Voters who labeled their political views as very conservative or conservative were less approving of the referendum (57.9 percent) than voters who labeled themselves as moderate or liberal (75.6 percent). Voters who said they were Republicans were less supportive (61.8 percent) than voters who said they were Democrats (80.9 percent) or in neither party (65.8 percent). Respondents with children under 18 in the home were more supportive of the change in the liquor laws (74.4 percent) than those without children in the home (64.3 percent). 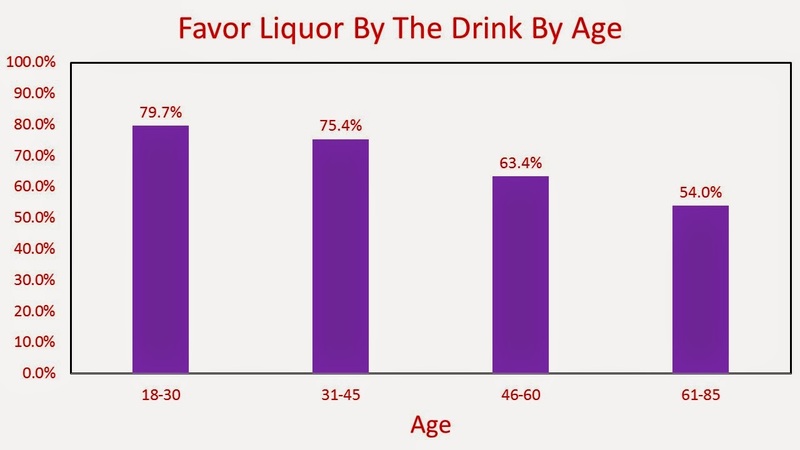 Younger voters were more likely to favor the liquor-by-the-drink referendum than the older voters. Among those 18-30 in age, 79.7 percent approved, while 54.0 percent of those 61 years old or older approved. Age no doubt helps explain the higher approval among those with children in the home. Single respondents, however, were more supportive of the referendum (76.5 percent) than married (64.7 percent). Respondents with more formal education were more likely to want to change the laws than those with less formal education. Among those without a college degree, 58.4 percent approved. Among those with a bachelor’s degree, 75.7 percent approved. Among those with at least some graduate education, 68.8 percent approved. Income level, employment status, and gender didn’t make a difference. 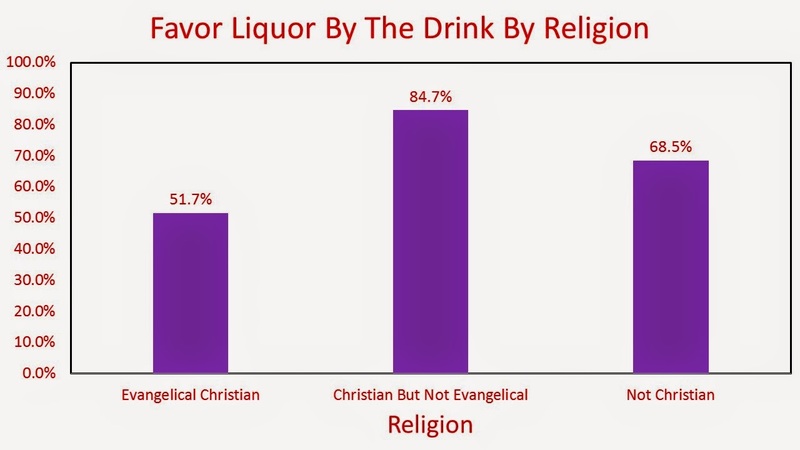 Religion did make a difference in responses to the survey question on the liquor-by-the-drink referendum. Those who labeled themselves as Evangelical Christians were less supportive of the referendum (51.7 percent) than were those who labeled themselves as Christians but not Evangelical (84.7 percent) and those who did not label themselves as Christians (68.5 percent). 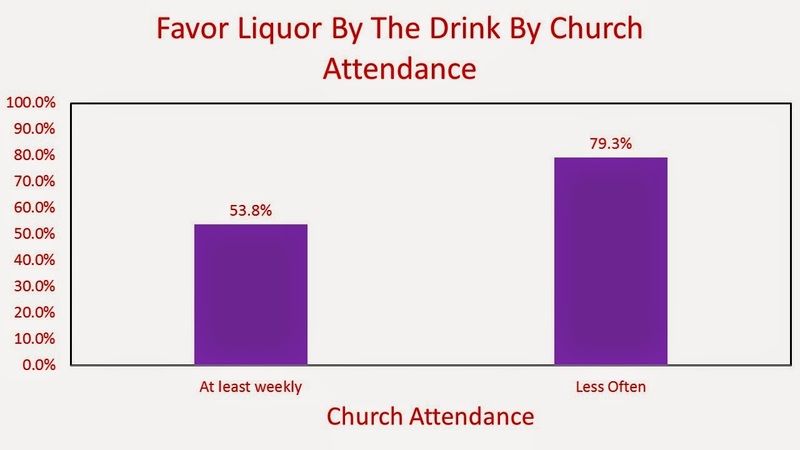 Registered voters who reported attending church at least weekly were less supportive (53.8 percent) of the change in the liquor law than were those who reported attending church less often (79.3 percent). What is striking about all of these subgroup comparisons is that in no case was less than a majority in favor of the change in the law. The data are from a sample, and the estimates are just that, but the pattern is strikingly consistent. The data from the survey conducted just before the Nov. 4 election and the election itself show just how strongly sentiment among voters in the county on liquor laws has changed from the previous elections. The survey my students conducted of Oconee County registered voters in the same class last October had anticipated that change. Two questions in that survey dealt with the county’s liquor laws. The first focused on Sunday sales. A second question on liquor by the drink also referenced Sunday sales, though the county did not allow liquor by the drink on any day of the week. “Oconee County also does not allow the sale of liquor (including cocktails, whiskey, etcetera) by the drink in restaurants on Sundays. Do you think this ban should remain or should the ban be lifted? In response to the first question, 62.9 percent of the 210 registered voters surveyed said they wanted to life the ban. In response to the second question, 67.1 percent said they wanted to remove the ban on liquor by the drink. In each case, the question was followed by a probe asking the respondent why she or he held the position articulated. In light of the current discussion about the change in sentiment, I went back and analyzed those responses. The percentages of approval of liquor by the drink are remarkably consistent across the two surveys and with the actual election outcome. Of the 131 responses of voters in 2013 who said they wanted to allow liquor by the drink in Oconee County, 36 (27.5 percent) said it was simply a matter of letting people have the freedom to do what they want to do. “People should be able to purchase what they want with their own money,” one voter said. “It is a stupid rule when Clarke County is five minutes away,” one said. “After five years of seeing beer/wine, statistics show no adverse effects,” another said. Respondents also gave economic justifications for wanting to change the rules. Of the 131 responses, 27 (20.6 percent) made that case explicitly. “It would bring new restaurants into Oconee County and give more people jobs,” one voter said. Eight voters (6.1 percent) said it was a matter of getting better restaurants, with two of them mentioning national chains. One mentioned Ruby Tuesday explicitly. Fourteen of the voters (10.7 percent), said the reason to change the law was simply a matter of convenience. The change in law would be “convenient for persons who want to drink while eating,” one said. The responses to the survey last year indicate that voters are open to further relaxing of the county’s alcohol laws to allow for the Sunday sales of beer and wine in groceries and convenience stores and Sunday sale of beer, wine and alcohol restaurants. Richard Miley, one of the owners of Catch22 Gastropub, at the corner of Epps Bridge Parkway and Parkway Boulevard, told the Board of Commissioners at the first public hearing on the proposed liquor-by-the-drink ordinance on Dec. 16 that he would like the county to visit that issue soon. Miley also said he would like the BOC to eliminate the requirement in the current law that each patron must purchase food with an alcoholic beverage. Commission Chairman Melvin Davis recommended that the Board consider removing that requirement in the ordinance drafted by County Attorney Daniel Haygood and before the body for consideration at its meeting on Tuesday. That meeting starts at 7 p.m. in the Courthouse in Watkinsville. Davis also said the Commission should consider relaxing the requirement in the draft ordinance that no more than 25 percent of the gross income at the restaurant be from the sale of alcoholic beverages. Finally, Davis said the commissioners should look into expanding the areas in the county where alcohol can be sold in restaurants. He suggested including all of SR 316 as an area for alcohol sales. At present, alcohol can be sold along SR 316 only from the Clarke County line to the intersection with U.S. 78. My students were able to complete their interviews and their assignments only because of the willingness of voters in the county to respond to their questions. Those responses are confidential, as is the identify of those who responded. I thank all of you for helping the students and for making the project a success. Other stats to consider are changes, if any, of #'s of DUI or other alcohol-influenced crimes. My biased guess is no change.